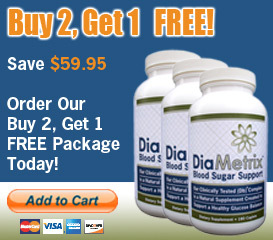 DiaMetrix Health has approached the diabetic market with a strong focus on research and an honest marketing approach. There are dozens of natural products on the market all promoting healthy blood glucose levels, but none of them have any credible clinical research to support their claims. Sure, they all spout the same old worn out studies on some of the individual ingredients in their formula, but none of them can claim credible, effective results of clinical research on their complete formula. 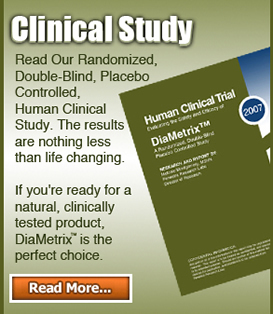 DiaMetrix is the only dietary supplement available targeting healthy blood glucose levels that has been clinically shown to dramatically promote healthy blood glucose levels with two double blind, randomized, placebo controlled clinical studies on the exact formula you may purchase. Practically every product promoting healthy blood glucose levels contains one or more of the ingredients contained in DiaMetrix. Here are some examples: Diabin has bilberry leaves, fenugreek seeds, and prickly pear. Diabetiks has vitamin C, vitamin E, folic acid and biotin. 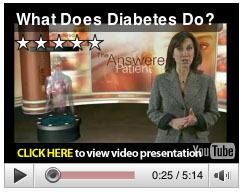 Diabetrol has vanadyl sulphate, fenugreek and chromium. Diamaxol uses gymnema sylvestre, biotin and chromium. Glucotrin has gymnema sylvestre with rerilla oil and banaba leaf. Glucotor contains gymnema sylvestre, fenugreek seeds, banaba leaf, and bitter melon. Melabic contains gymnema sylvestre, cinnamon powder and bitter mellon. Glucoten has gymnema sylvestre, bitter melon and banaba. Glucobetic uses gymnema sylvestre, vanadyl sulfate and bitter melon extract. Cinnergen focuses on cinnamon. Glucozene has vanadyl sulfate and chromium polynicotinate. Glucose Factors contains garcinia cambogiam, banaba and fenugreek. Sugalor contains vanadyl sulfate and chromium. Glucochrome has vanadium, bitter melon and gymnema sylvestre. This is understandable. Most of these ingredients have undergone clinical testing indicating some degree of support for healthy blood glucose levels. But what happens when we combine two or more of them in the same formula? Good question. Nobody really knows unless the whole formula is tested for safety and effectiveness. None of the products listed above has credible, effective clinical evidence supporting their claims. 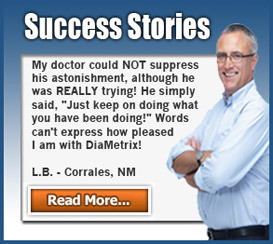 DiaMetrix does. And that evidence is positive and profound. During the DiaMetrix 90-day trial period, A1c levels among active participants dropped over 3 percent (7.7 to 4.66), fasting glucose levels by over 105 pts., triglycerides by over 20%, LDL cholesterol by over 34%, total cholesterol by over 29%, with a nearly 10 lb. weight loss! In March of 2010, we commissioned a murine (mouse) study to compare the efficacy of DiaMertrix to the three top-selling diabetic medications: metformin, Actos, and Byetta. We created two groups of 40 mice, one normal diet, one high-fat diet. Each of these groups was divided into 5 groups (control, DiaMetrix, metformin, Actos, Byetta). We measured 45 biological markers including 35 cytokines, growth factors, glucose, cholesterol, and triglycerides. Organ pathology was assessed visually at necropsy and by microscopy of hematoxyllin-eosin stained formalin-fixed tissues. Results showed that DiaMetrix exerts a salutary effect in diabetes by significantly regulating expression of a broad range of surrogate markers of diabetic severity. DiaMetrix significantly out-performed metformin, Actos, and Byetta as an effective intervention for type 2 diabetes. We presented these findings at the International Diabetes and Obesity Forum in Athens, Greece in Oct. '10. Our findings are scheduled for publication in fall 2010 in "Current Topics in Nutraceutical Research."